Socialization is vital to raising a well-adjusted, calm and happy dog. And there’s no better time to start socializing your dog than when he or she is a puppy. In this episode of Pet Talk, Dr. Sarah’s joined by a very special guest who will help demonstrate the ins-and-outs of early canine socialization. Learn what to expect at certain periods of development, what to avoid when teaching puppies and the importance of positive reinforcement. In this video, Dr. Sarah shares valuable tips that can help your puppy grow up with the social skills needed over a lifetime. No one likes a bad hair day … and that includes your dog. Just like with humans, the skin is the largest organ of a dog’s body. Every day, their skin and coats are exposed to UV rays, pollution, infectious agents, drying heat or wind. 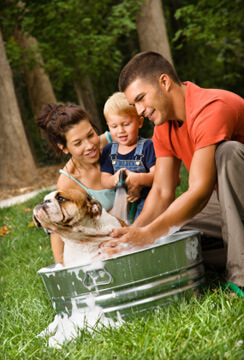 Because it can contribute to a dog’s overall health, grooming should be an essential part of companion animal care. However, despite your best intentions, it’s not unusual for grooming habits to hit a glitch. Or two. Or three! While bathing a dog, I think all of us have experienced getting wetter than your dog, being interrupted by phone calls, or, worst of all, a sudsy canine tearing off, leaving a wet, sudsy trail behind him. As a veterinarian with a good deal of grooming experience, I can tell you that planning ahead can reduce unwanted problems and stress, so here are a handful of my best tips.